Oral Fixations is a single channel video installation that evolves over a seven hour time period. The project is a darkly humorous look at a habit of endless consumption and the resulting accumulation of waste. A narrative gradually emerges from the on-screen action that depicts a large mouthed character who dances while flossing its one protruding tooth. A conveyor belt regularly delivers factory-farm fresh hams that the character delights in taking one large bite from and then tossing aside. Over the duration of the piece the hams begin to pile up in the room until at the end of seven hours the room is filled with the refuse of this gluttony. 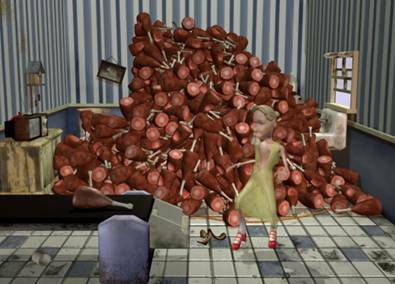 The viewer is encouraged to revisit the piece periodically throughout the day and see how the discarded hams build an oddly humorous environment of waste around the character. This project is a seven hour installation piece that was produced by an interdisciplinary team of seven artists, actors, and computer scientists. The length of this piece introduced several technical challenges: displaying changing images for seven hours at a constant frame rate and simulating the motion of seven hundred falling hams. We will use MAX/MSP to composite three layers of background, foreground and human figure and to display the final video. Each iteration of the character's motion was constructed using several technical elements. The animation of the character is motion capture data captured using a Vicon motion capture system with 12 MX-40 cameras. The motion capture data has been non-uniformly scaled in Maya to emphasize the action. The floss is a dynamic simulation created within Maya.